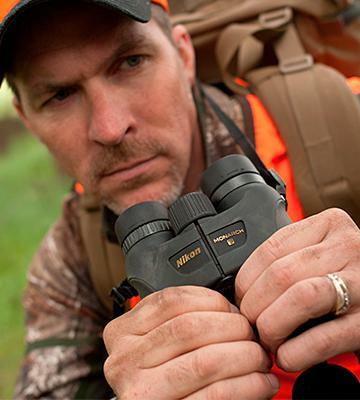 Diopter locking prevents your settings from detuning during active use of Bushnell binoculars. 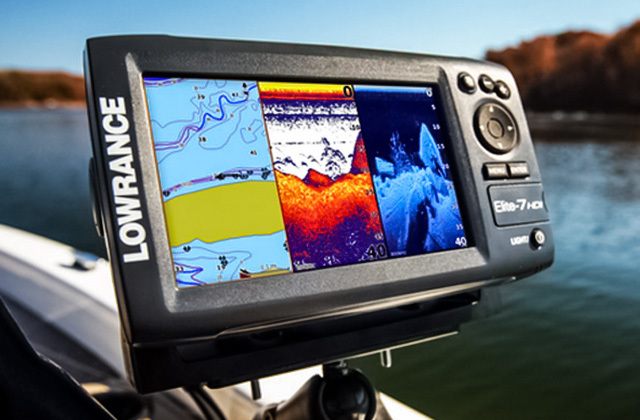 Top-notch ED Prime Glass ensures accuracy and detailing of colors. Lens caps don't fit very tightly, so be careful not to damage the lenses. Superior specification provided by these Bushnell binoculars makes them suitable not only for observing the nature but for use of professional hunters as well. Small size and weight make it easy for you to take these Nikon binoculars anywhere you go. 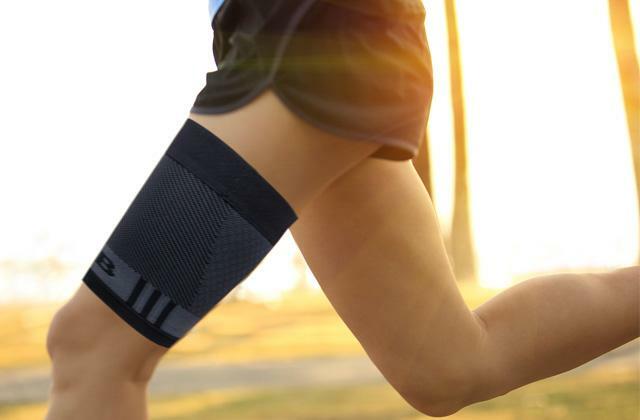 The reinforced fiberglass chassis is highly resistant to scratches and shock. 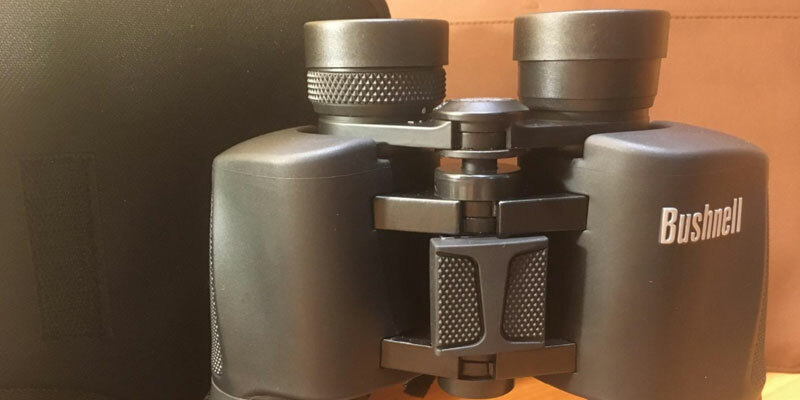 These cool binoculars are shipped without a case for storage and carrying. These are fantastic binoculars for bird watching, animal watching, and for surveillance in general. Thanks to the patented InstaFocus® focus system, you can quickly focus on different objects with a single move of your finger. BAK7 prism material makes the view, produced by these best deal binoculars, a bit more obscure than in other binoculars. 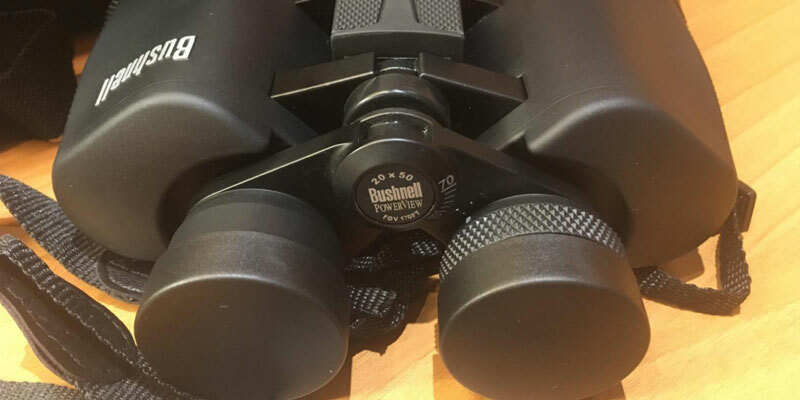 The availability of several ratios of magnification allows you to pick the right version of this Bushnell binoculars: from a simple nature observation to surveillance of celestial bodies. Celestron binoculars is one of the best in terms of the magnification rate. Thanks to the stunning 25x zoom, you can see every single detail of the objects that are really far. Unlike many other binoculars, this one comes with a tripod. These Celestron binoculars are rather heavy, so watching fast-moving objects might be slightly inconvenient. It's the best binoculars for observing the sky and other distant objects. Top choice for Federal Wildlife marshals who need to keep track of animals and birds. The wide viewing angles allow for focusing in on scenes without missing any important details. 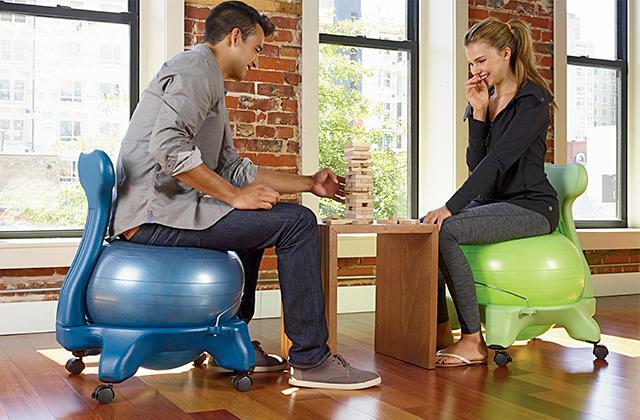 Great ergonomics for a long-hour viewing experience. 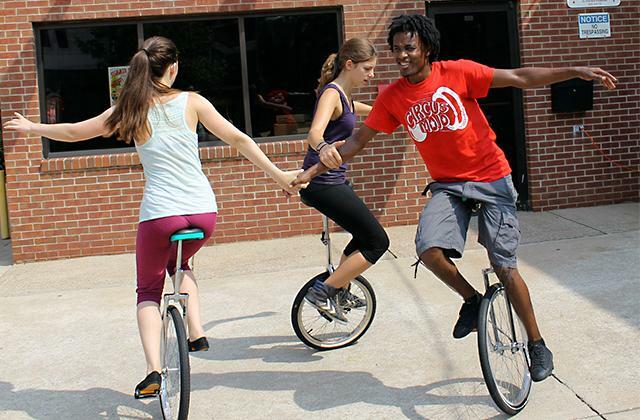 The lightest of all five models in our list. The magnification ratio is relatively small. 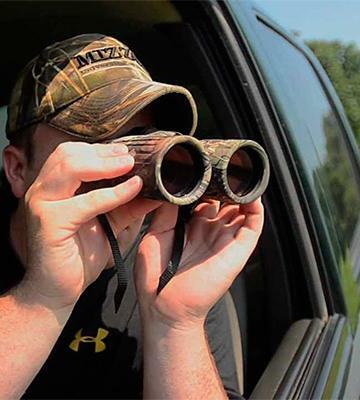 A great pair of binoculars that is suitable for most of general purposes and activities. Provides a crisp detail of objects without compromising on brightness and contrast. Feels light and nice in hands. Comes at a very affordable price so make sure not to miss it. Bushnell Legend binoculars are a typical model with 10x magnification, which means the object you see will be 10 times bigger than it is in reality. They provide quite a good accuracy. The size of the front lens of these cool binoculars is 42mm, which means the exit pupil is 4.2mm and the optical efficiency amounts to 17.64. 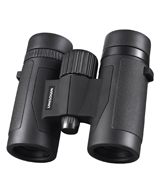 Therefore, these fantastic binoculars can be used even in the evening or in the dusk. The field of view is rather wide - you can see the area of 340 feet at a distance of 1000 yards, so watching wild animals will be simple and fascinating. 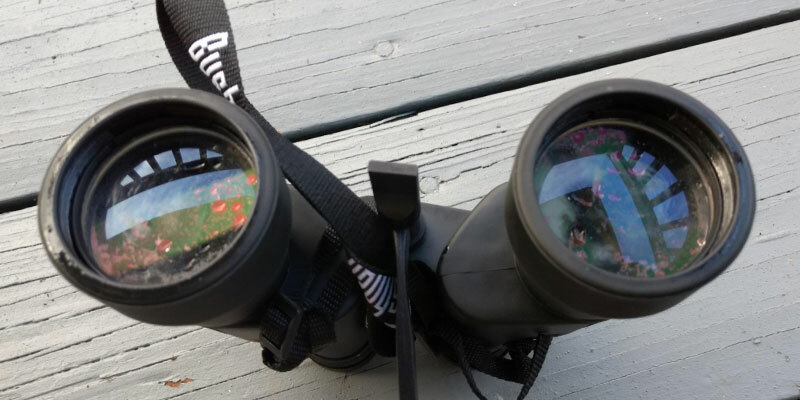 These are perfectly suitable binoculars for birdwatching. The optical system of Bushnell binoculars is based on a roof prism, thanks to which the binoculars are rather compact and smaller than many of the competitors. The prism is made of BAK4 glass, so the view you observe is distortion-free and detailed. Branded ED Prime Glass lenses are made of extra-low dispersion fluorite glass which provides a good view in case of poor illumination. RaidGuard HD ensures the maximum accuracy of the view during a rain - that's certainly one of the advantages of Bushnell binoculars. The chassis (i.e. 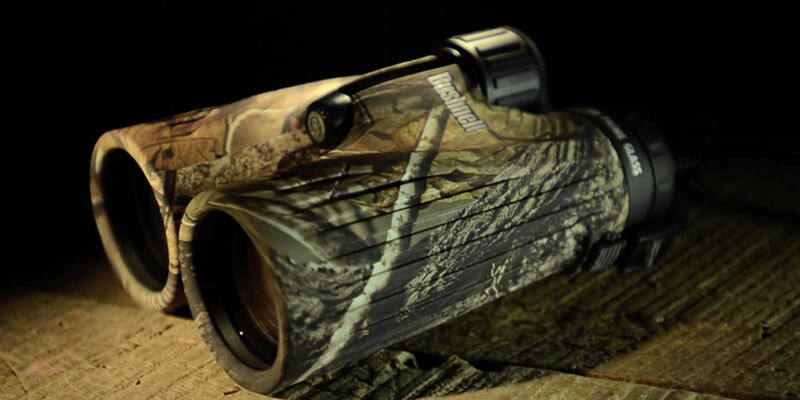 casing) of these Bushnell Legend Ultra HD binoculars is made of magnesium with a rubberized surface. Apart from being extremely durable, these binoculars firmly sit in your hands and you won't accidentally drop them. 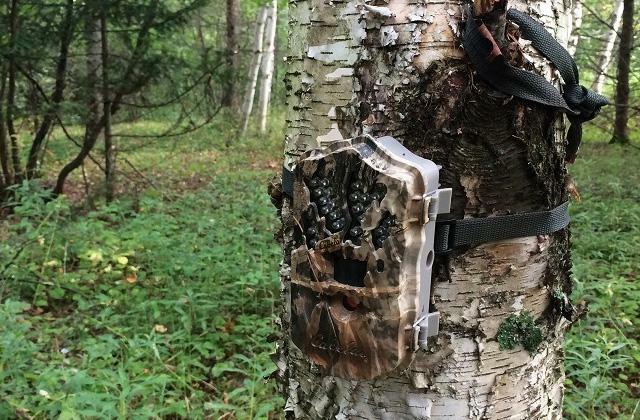 Also, the item is totally waterproof and dustproof; if a rain starts, Bushnell binoculars won't be damaged. On the inside, this unit is filled with nitrogen to prevent fogging even if the air is really humid. This design peculiarity makes a positive effect on the quality of what you see through these binoculars. If you wear glasses, no problem since the eyecups can be twisted up if necessary. In case you have different eyesight on your eyes, just use a diopter adjustment ring and lock it to 'save' your setting. That's useful if you move a lot. If you wish, you can attach this unit to a tripod thanks to a tripod adapter slot. As for the weight, Bushnell binoculars weigh 24.7 ounces, so you can carry them without inconvenience. The front lenses of these Nikon binoculars are 42mm wide and they ensure a viewing field of 288 feet at a distance of 1000 yards. That's enough for observing birds, animals, or watching a landscape. This model is also suitable for hunters looking for animals. The exit pupil diameter is 4.2mm, so the optical efficiency is rather high - you can use these binoculars in a cloudy weather or in the evening. As for magnification, these Nikon binoculars zoom up to 10x, so you can watch really distant objects. The minimal focal distance for this model is 7.8 feet, just in case you are going to observe some insects. The lenses of these Monarch-series Nikon binoculars are made of extra-low dispersion glass that provides highly detailed color rendering and accuracy. Moreover, Nikon ED glass lenses are fully multi-coated. 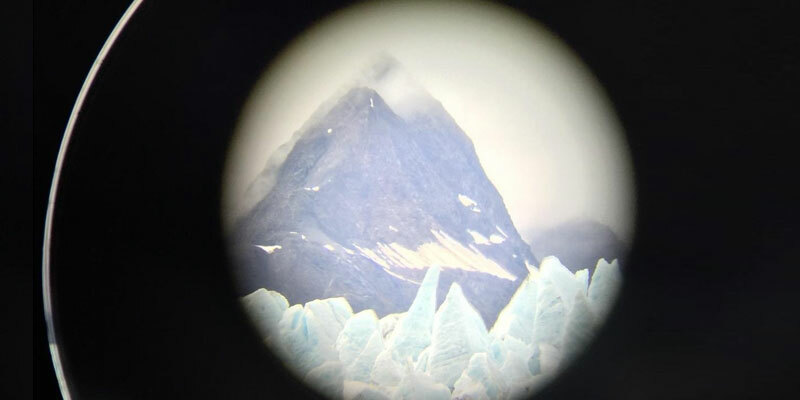 As far as the prism is concerned, Nikon binoculars have a Roof prism made of BAK4 glass. It makes this item very compact. Just like lenses, the prism glass is also multi-coated for the sake of high light transmittance and natural colors. 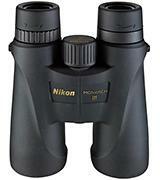 Monarch 5 Nikon binoculars are very popular with people who adore wild nature or hunting. They weigh just 21.6 ounces and carrying the item around is rather effortless. 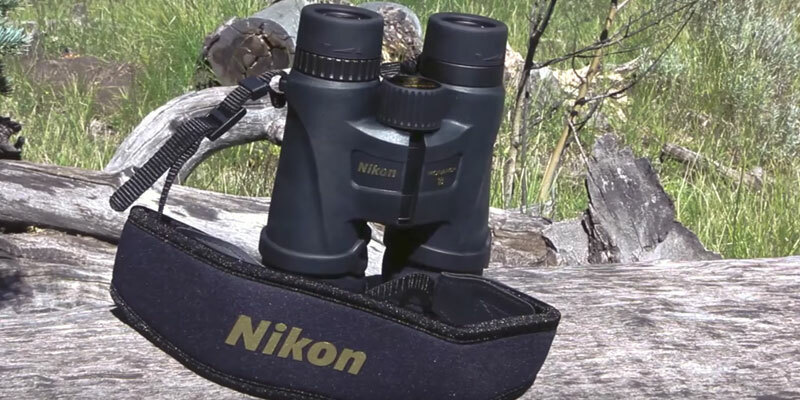 As for the chassis, it's made of a waterproof polycarbonate reinforced fiberglass and though it's not metal, Monarch 5 Nikon binoculars can withstand quite extreme conditions. If the weather is very humid, don't worry about foggy lenses, Nikon binoculars of this type are nitrogen filled and they don't fog at all. 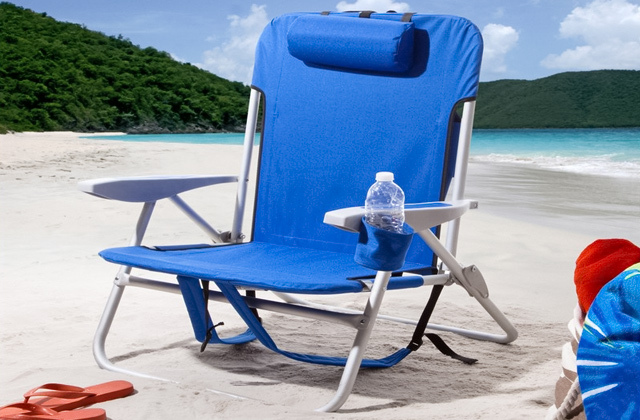 The unit is tripod mountable, though a tripod adapter must be purchased separately. No need to say, these superb binoculars have a diopter adjustment. As other roof-prism binoculars, these have a central focus knob. Finally, let's say a couple of words about eyecups, they are turn-and-slide: turn them to a fully extended position if you wear no glasses or to the retracted position if you wear glasses. It's simple! These excellent binoculars are available in a variety of models that provide different levels of magnification. Thus, you can pick the one you need: 10x, 12x, or 20x. The front lens diameter is the same for all versions of these PowerView Bushnell binoculars - 50mm. A diameter this big collects more light and expands the viewing angle. The 10x Bushnell binoculars have the following field of view: 341 feet at a distance of 1000 yards (exit pupil - 5mm), so if you need to use this device in the dusk - Bushnell binoculars are the right choice. In case you pick a 12x model, the field of view will be 267 feet at 100 yards (exit pupil 4.2mm). 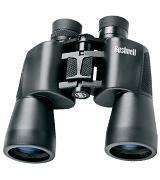 The 20x Bushnell binoculars are suitable for observing very distant objects - the sky, the sea, etc. Choosing this model, you will get this field of view: 170 feet at 1000 yards (exit pupil 2.5mm). We recommend using the 20x binoculars for watching distant objects in a good sunny weather. Imagine a hiking tour and magnificent views you will see thanks to these binoculars! These are classic binoculars that anyone can comfortably hold even though they are rather big. Unlike some other binoculars on our shortlist, that have roof prisms, this pair has a porro prism. The prism is made of BAK7 glass that makes these binoculars more affordable than its counterparts made of BAK4 glass. Don't worry about the view, it's still really good and highly accurate thanks to a multi- and fully-coated optics. Bushnell binoculars featuring a porro prism have a patented single-lever InstaFocus® focusing system, thanks to which you can focus on an object with a single move of your finger. 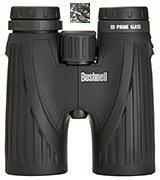 It makes these Bushnell binoculars suitable for observing the fast-moving objects, such as birds or animals. 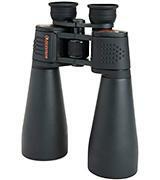 The chassis of these superb binoculars is made of a rubberized armored material, so a firm grip is guaranteed. These fantastic binoculars for bird watching is tripod adaptable if you buy a special attachment. It's self-evident, Bushnell glass has a diopter adjustment that people with poor eyesight will highly appreciate. 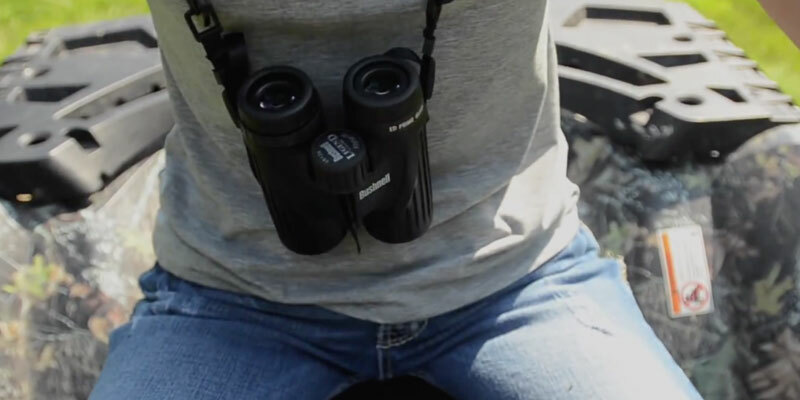 The eyecups can be folded down so that glass-wearers can use these binoculars. 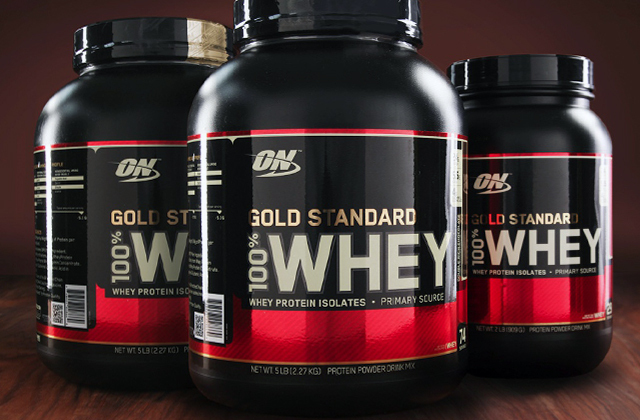 Finally, let's say a few words about the weight: the 10x model weighs 25 ounces, 12x - 29.8 ounces, and 20x - 30 ounces. 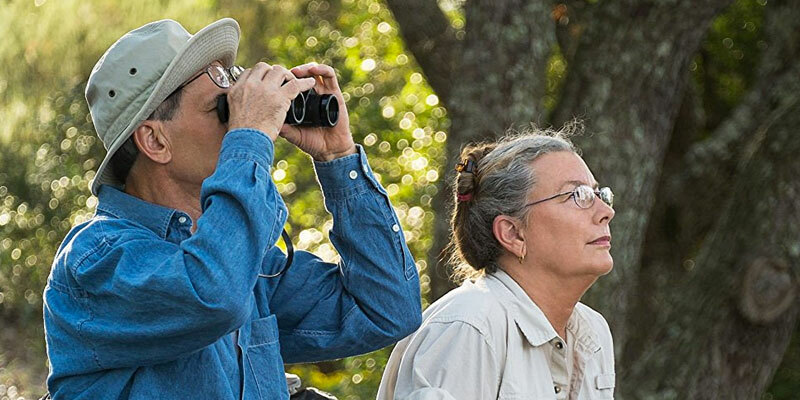 Celestron binoculars are recommended by nearly any binocular buying guide. 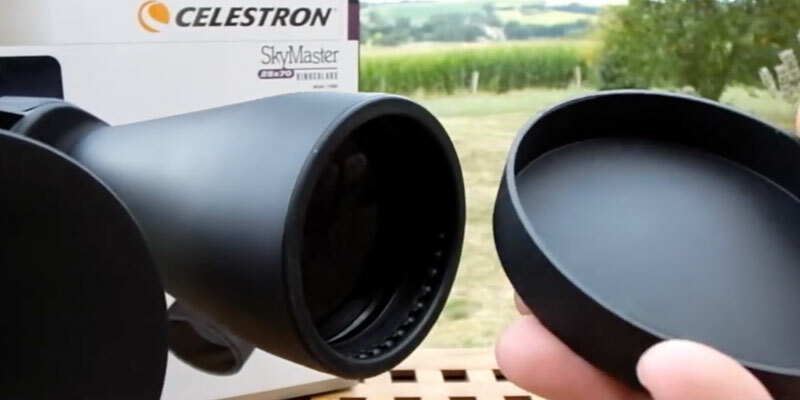 We have picked Celestron 71008 SkyMaster since they boast an outstanding magnification rate of 25x. No wonder, the front lenses are rather wide in diameter - 70mm, so the light transmittance is incredible. The field of view these cool binoculars provide is 141 feet at a distance of 1000 yards. The exit pupil diameter is 2.8mm. 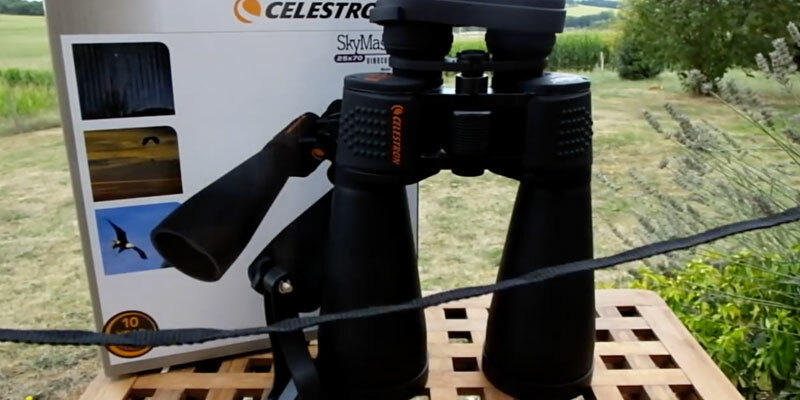 Thanks to immense magnification capabilities, Celestron binoculars are the most suitable for watching distant immobile objects, such as celestial bodies. If you want to enjoy the Moon 0 these binoculars are what you need. You can even try finding the Apollo 11 landing place! Celestron is incredible for astronomical viewing. Of course, you can use these binoculars for gazing into the sea and looking for an attractive harbor while sailing your yacht, for example. These binoculars aren't the best choice for watching the objects moving really fast, though. The minimum focus is 75 feet - too many for watching close objects. The big size of these binoculars is due to the use of a porro prism. Thus, these are classic binoculars. 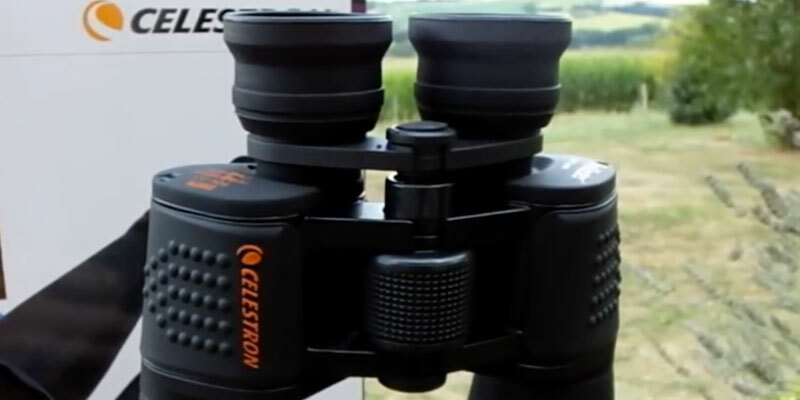 Despite their size, Celestron look-see is very convenient to grip and carry. All optics used in these cool binoculars are made of superb BAK4 glass. It goes without saying that Celestron designers keep up with the Johnses and use a multi-coated optics for the sake of clear and sharp views. You will definitely enjoy watching distant mountains and valleys at Yellowstone National Park. However, we'd like to emphasize once again that these are excellent binoculars for stargazers who adore stars. Unlike many other binoculars on the market, this one is shipped with a tripod adapter, so you can easily mount it and enjoy shake-free views. Actually, we strongly advise you to do so, since the weight of these Celestron binoculars is rather big - 52 ounces. The chassis is covered with rubber for firm and non-slip grip. Also, the rubber coating protects the binoculars from scratches. As nearly all modern binoculars, these have a diopter adjustment on the right eyecup. 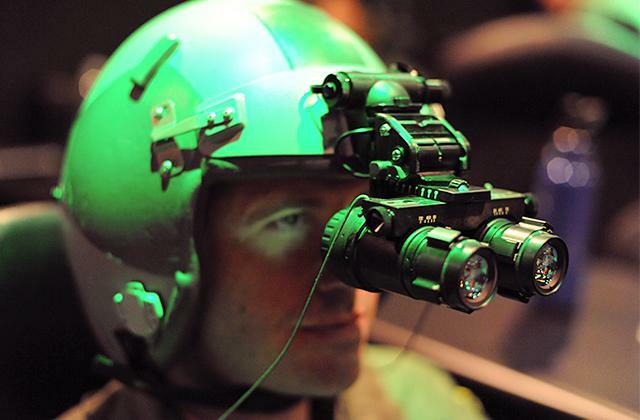 No need to say, the eyecups can be adjusted so that glass wearers can use these binoculars too. The eye relief of Celestron SkyMaster binoculars is 13mm - ideal for people who wear glasses. The Wingspan Optics Spectator 8X32 binoculars provide wide viewing angles for shooting outdoor activities at pretty long distances. Much cheaper than most of the aforementioned models, the Wingspan Optics Spectator doesn't compromise on the clarity and detail of the image. With the 32 mm objective lens, 4 mm exit pupil, and 14.8 eye relief, it can focus in on a target from up to 1000 yard-distance and bring impeccable close-ups of things you want to see. 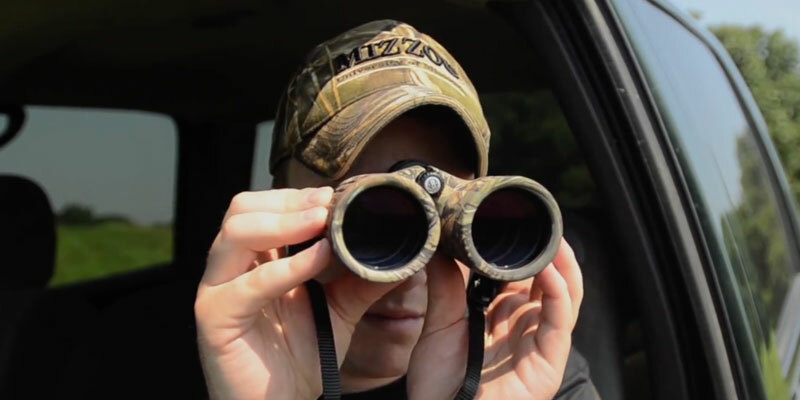 The Wingspan Optics Spectator 8X32 binoculars are pocket-sized, extremely lightweight, and easy to carry. If you do not want to carry them in hands, you can always wear them around your neck using a neck strap that comes included in the kit. Or you can put them in a handy nylon mesh case to pack in a backpack. The manufacturer has done its best to ensure that you can use this binocular comfortably and safely in any conditions. As the Wingspan Optics binoculars are fitted with a roof prism, they are naturally more compact and lightweight than any of the porro prism binoculars, where objective lenses are placed above eyepieces. Contrary to the common perception of roof prisms as little light efficient, the optics of the Wingspan binoculars is great and doesn't comprise the image contrast and light. Any target within the distance of up to 1000 yards will look crisp and detailed. However, the biggest advantage to this model is that it provides the widest field of view. If you've been searching for a binocular for bird watching and/or hunting, this is your best choice. With the maximum focus of 9.8 ft. the lens provides, you'll be able to see most of the observable scene. 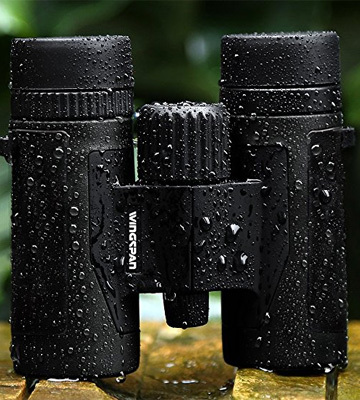 The best part is that the Wingspan Optics binocular is also water-proof, which means it can be safely used in any weather conditions without risks of doing damage to the optics. 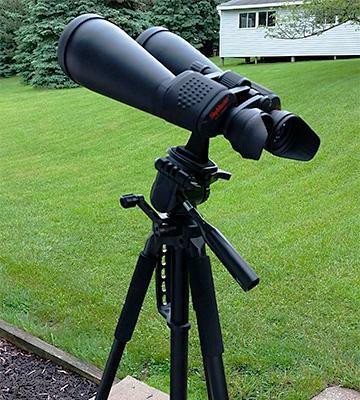 Other convenient features the binocular offers include a handy tripod adapter that the manufacturer supplies in the box, a carry case for its safe storage and transportation and a lens cover for keeping the optics protected against scratches and damage. As you can see, this pair is pretty decent and definitely worth your consideration. Though it is not a professional-class equipment, it possesses all of the characteristics that are important for comfortable viewing of near and faraway objects. And given the price of these binoculars, we'd recommend you not to miss this fantastic offer. Binoculars are, basically, 2 mirror-symmetrical tubes with lots of lenses, mirrors, and a prism. Simple as they are, binoculars give quite a lot of opportunities for people of different professions. As you know, best binoculars are used for observing the distant objects that are too far for human eyesight to spot. Thanks to binoculars, you can zoom the object in and see every single detail of it. Who needs it? Lots of people. Binoculars make it possible for us to watch birds, to orient during a hiking tour, to watch the surface of the Moon, to see faces of your favourite music band during concerts, and so on. And it's self-evident that binoculars are an absolute must-have for any hunter or a border guard! In general, if you like nature and wilderness, you should certainly get a cool pair of binoculars. Those who adore backpacking and camping will also appreciate our review of the best sleeping bags that are necessary for spending nights in the open country. 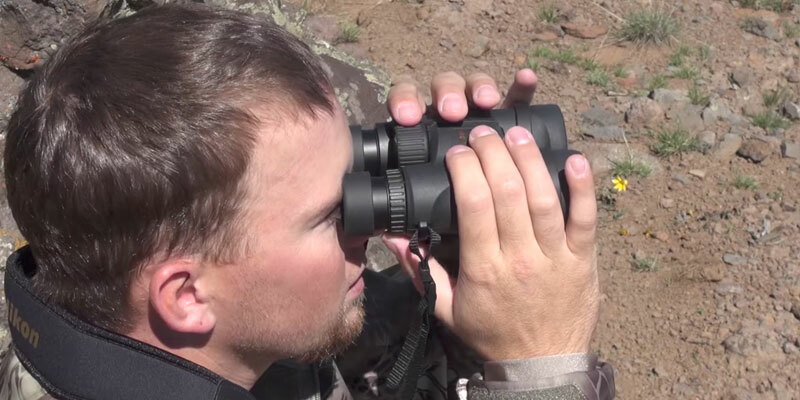 There are 3 major features you need to pay attention to when choosing best binoculars: a magnification rate, a front lens diameter, and the exit pupil. The quality of what you are going to see through any binoculars depends primarily on them. Let's explain each parameter so that you understand what they mean. So, the magnification rate tells you how many times you can enlarge a distant object. The more the better but the quality and accuracy suffer. 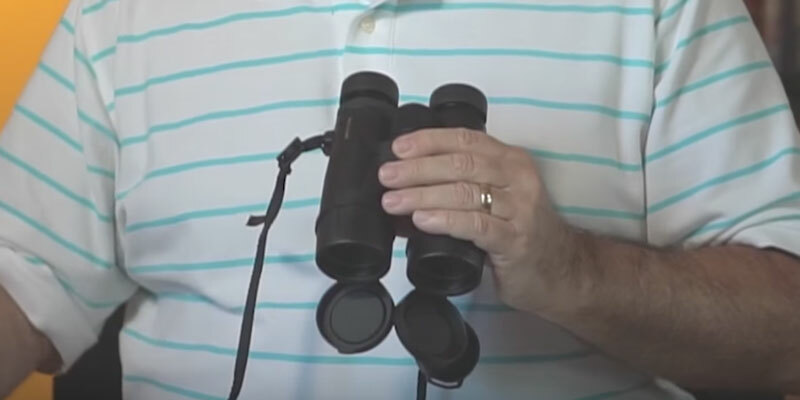 If you need best binoculars for birding, choose a model that has a magnification rate of 8x and lower - you will be able to find the object and focus on it rather quickly. If you wish to observe a pride of lions from afar in Africa - choose binoculars with a higher magnification rate. The diameter of the front lens impacts a viewing angle and the amount of light the lens can collect. Thus, the wider the lens is, the more you will be able to see. Finally, consider the exit pupil. It depends on the previous feature and the higher the exit pupil is, the better you will be able to see in the evening. Be careful when choosing lens parameters, consider what you need binoculars for, then proceed to the other important aspects described further on. 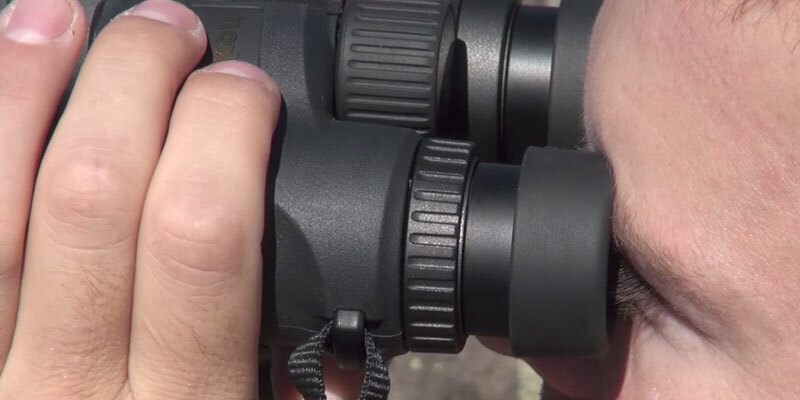 Now, it's time to consider the optic system of all best binoculars in our review. The keystone is a prism that transforms and rotates an image so that our eyes can see the object as it is, not upside down. The prism and the material it's made of are really important since it impacts the quality of what you see and the size of the binoculars. Today, 2 major types of prisms are used: roof and porro. Roof prisms are smaller and, therefore, binoculars with roof prisms are more compact, too. However, porro prisms are rather popular even today; it's a classic design of binoculars. The units with a porro prism are usually quite convenient to carry and hold. Next, find out what type of material a prism is made of - it impacts the view you see. As usual, 2 types of glass are used to produce prisms: BAK4 and BAK7. BAK7 prisms are usually installed on cheaper models but there's a drawback - the view on the sides will be more obscure than that in the centre. BAK4 prisms are far superior in terms of the view they produce. Also, the best binoculars have a multi-layer coating of lenses and prism - it helps get a rather bright view even in the dusk. In the end, you need to consider how convenient binoculars are and if you will feel comfortable using it. 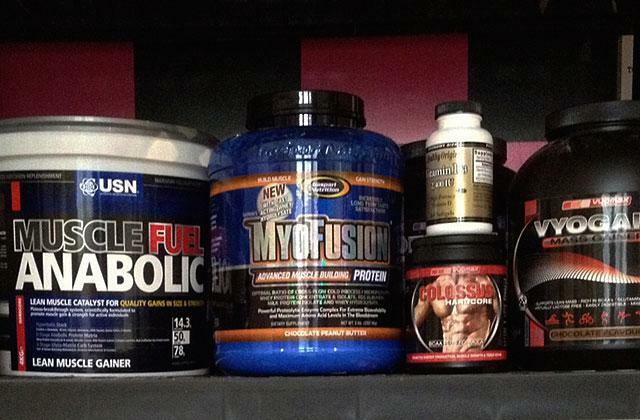 So, what to start with? First of all, pay attention to the material all binoculars are made of and what coating they have. If you need binoculars for really extreme situations, choose a reinforced or magnesium chassis (shock-resistant and durable). The chassis should be rubberized so that the unit doesn't slip out of your hands. Also, find out if binoculars are waterproof - if yes, you will be able to use a unit during the rain or when fording a river. A shift in the temperatures leads to the appearance of fog on the lenses and that mustn't happen to binoculars, so we recommend you to get the one with a fog proof chassis. And no need to mention, binoculars should be quite lightweight in order not to be a burden for you. How to make it fog proof? It's easy - such binoculars are filled with some gas (usually, nitrogen), which is invisible to a human eye but prevents fogging. Also, don't forget to check some other convenience features: for example, twist-up eyecups allow you to use binoculars even wearing glasses. And if you have different eyesight on your eyes, pick binoculars with a diopter adjustment (an appropriate ring is usually on the right eyecup). Finally, the more you zoom up, the 'shakier' the view will be and you might need a tripod. However, most binoculars are tripod adaptable. 1. How to Choose Binoculars, wikiHow. 2. Binoculars: How to Choose, REI. July 28, 2016. 3. 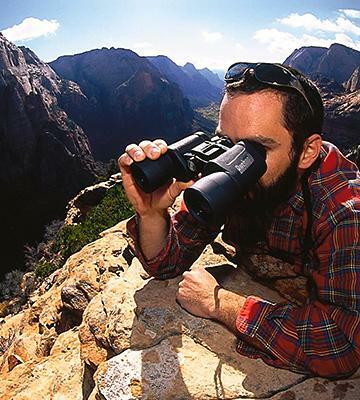 How to Choose Binoculars, Eastern Mountain Sports. 4. Dave Brody How to Choose Binoculars for Astronomy and Skywatching, SPACE. October 22, 2015. 5. 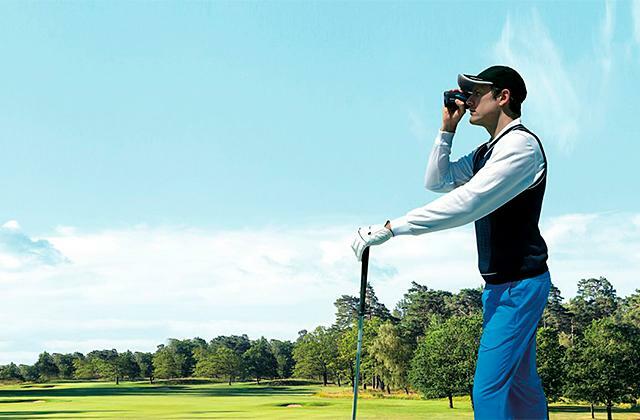 How to Choose the Right Binoculars, OpticsPlanet. July 17, 2015. 6. Binoculars, Wikipedia. October 3, 2017. 7. How to use CF binoculars / Nomenclature, Nikon Corporation. 8. Melissa Mayntzu How to Focus Binoculars, The Spruce. April 4, 2017. 9. 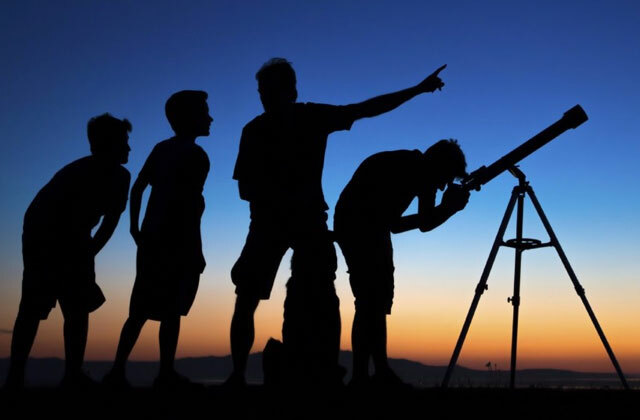 Top tips for binocular stargazing, EarthSky. July 14, 2017.